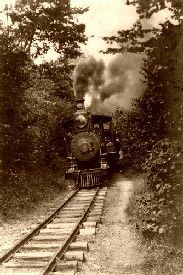 Figuring prominently into every aspect of America’s history is the railroad. 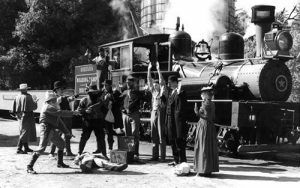 Involving ingenious entrepreneurs, armies of workers, and the ultimate conflicts with Native Americans and outlaws, railroad history and tales are yet another fascinating aspect of westward expansion. Beginning in the 1830s, the nation realized the need to connect the east with the Pacific coast, shortly after the railroads began large-scale operations. 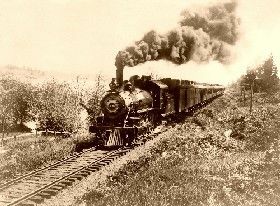 The first survey for a transcontinental railroad system was made in 1849-50 by Howard Stansbury, who surveyed a route through the Black Hills and south of Salt Lake City. Further measures were taken in March of 1853 when Congress approved a survey by the War Department. Seeing the future, George Pullman began building sleeping cars as early as 1858. But Congress would dally for another four years, debating the route the transcontinental railroad should be built, until finally it approved the passage of the Pacific Railway Act in 1862, authorizing the building of the transcontinental railroad westward from Omaha, Nebraska by the Union Pacific Railroad and eastward from Sacramento, California, by the Central Pacific Railroad. 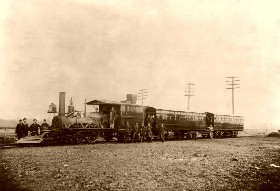 The act further provided loans for the building of the railroad, as well as sections of public land, ultimately resulting in the railroad companies acquiring 33 million acres of free land. When the Civil War began, the building of the railroad was initially slow due to lack of investors; however, when the war was over, construction began in earnest. The building of the railway required enormous feats of engineering and labor in the crossing of plains and high mountains as railroad workers suffered during bad winters, desert heat, lack of supplies and Indian attacks. On May 10, 1869, the two railroads met in Promontory Summit, Utah, joining 1,776 miles in a great ceremony heralded as the “Golden Spike” celebration. It was perhaps the world’s first live mass-media event, as the telegraph lines buzzed with the event and photographers snapped hundreds of photos that would quickly appear in newspapers across the globe. In no time, the railroad accelerated the population of the west, caused wagon trains to become obsolete, increased commerce in the nation, and contributed to the decline of Native Americans. Railroad passengers first paid as much as $111 for first class from Omaha to Sacramento to $40 for the lowest class.